This is my favourite seasonal album and it's one which I've heard many, many versions of. I will state that one version I have no heard, which I'm sure is excellent, is the 2LP 45rpm Analogue Productions release mastered by Kevin Gray and Steve Hoffman. With that noted, the 33rpm Analogue Productions all analogue mastering by Kevin Gray pressed at QRP is hands down the best I have ever heard these collections of songs come across. Whisper quiet vinyl, dynamics by the bucketloads and unrivalled clarity and fidelity, if you're still in the market for this title I'd suggest buying it while you can still get one for $100 or so because the 2LP 45rpm set goes for $200+. I was fortunate enough to get one last year close to original MSRP (I paid less than $40 for it) and boy oh boy has it already seen a good 10 or so plays through, magical collection of songs that will always put you in the mood for Christmas. How do I buy this vinyl yellow cover album for myself? Quiet pressing and suuuper dynamic sound. The 45rpm version probably sounds the best, but this pressing is nothing to scoff at. This is one of my favorite Christmas albums, so it'll be getting a lot of spins in during the holiday season - if you find yourself in a similar situation, don't hesitate to grab one of the last few copies of these. It's a great treat for the ears. Very nice sound and quiet pressing. A Christmas essential for collectors. Mastered very loudly by someone with an ear for other styles (I'm guessing?). Good at any time of the year, there's some real gems on this album. Sampled a partial vinyl rip from the 45rpm version on Youtube, and when I compared even that with: the 2003 SACD (best), the 2006 remaster (OK), and a 2011 "24 bit" (the worst), it was obvious that the 45rpm was way superior. I took a look at the prices for the 45 and thought maybe I'd look for an original pressing instead, but luckily saw this release. So I'm all set for Christmas 2018. Got a copy today for a belated Christmas gift. According to the red and white sticker underneath the black and white one, looks like the orginal plan was for the record to be: "Red and White Starburst Vinyl" Limited to 1000. Guess there was a problem with producing the effect! A1 O Tannenbaum - has a few additional seconds of a run up the piano before the track begins on earlier versions. A5 Christmas Time Is Here (Instrumental) - does not fade out as it does on other releases. B2 Skating - does not fade out as in earlier releases. 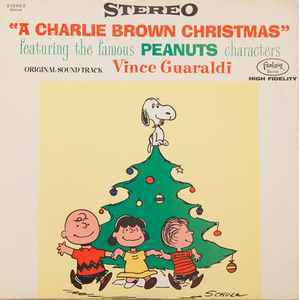 A truly exceptional Christmas album. Just magical! On this particular pressing, it sounds pretty good, though I found it to be mastered very loudly. I have to turn the volume down about 10 increments from where I normally play vinyl. Still, it looks beautiful and makes the holidays all warm!